Want a truly nourishing experience? 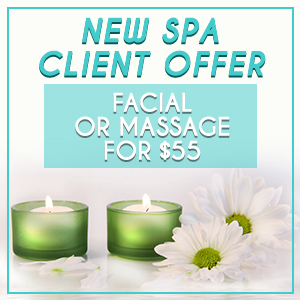 Try one of our packages, combining facial, body and massage components, and make wellness a habit with a monthly membership! Indulge your senses as you enjoy a Deep Cleansing Organic Facial and a Swedish Relaxation Massage. Escape from all of your worries! Experience true bliss and radiantly soft skin as you enjoy our Coco-Luscious Body Scrub and Wrap and a mini-facial. Then, all of your concerns are eased away as your Swedish Relaxation Massage begins! A full-body Swedish Relaxation Massage is followed by our Fire and Ice Facial and 30 minutes of the deeply calming, classic Indian Shirodhara treatement. No long-term contracts. Unused prepaid sessions roll over 1 month. This monthly plan requires an automatic charge to your credit or debit card. No long-term contracts. Unused prepaid sessions roll over 4 months. This monthly plan requires an automatic charge to your credit or debit card. Unlimited classes, expires after one month. Unlimited classes, automatically renews each month. 10 sessions, expires in 4 months. 10 sessions, automatically renews after 10 classes/4 months. 5 sessions, expires in 2 months. 4 sessions, expires in 1month. Monthly therapeutic spa treatment and unlimited yoga.